Richard T. Matson, born 21 September 1855, was my 3rd cousin, 5x removed. He was a son of James V. Matson and Mary Lincecum. I found it interesting that James and his son each honored their father in the naming of sons. James named a son after his father, and Richard named a son after his father. Of course it's possible the names might actually date back further. 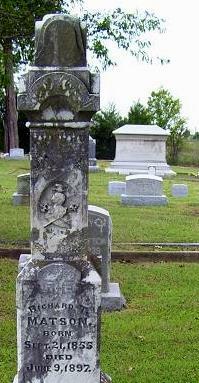 I recently found death and burial notices for Richard at GenealogyBank. He died at the young age of 41, but I don't know the cause. Richard was laid to rest in Fairview Cemetery at Hubbard, Hill County, Texas. The photo included is from his memorial on FindAGrave. MATSON -- Hillsboro, Hill Co., Tex., June 9. R. T. Matson, a prominent farmer and stockman of this county, died at his residence three miles west of here, to-day. He was 45 years old." MATSON -- Hubbard City, Tex., June 11 -- Mr. R. T. Matson, who died at his home three miles east of Hillsboro Wednesday, the 9th instant, was buried here to-day. Rev. C. Smith conducted the funeral services." Now, was his home three miles east or three miles west of Hillsboro?